An upgraded and refitted diesel-electric submarine from the Indian Navy fleet was handed back to India by Russia after over two years of overhaul and refurbishing works. The major refit of the Russian-origin INS Sindurakshak (S63) was carried out at Russia’s Zvezdochka shipyard. The upgrade and modernisation of Sindhurakshak, a Project 877 EKM NATO Kilo-class submarine, was done under a contract signed in June 201. Under the refit programme, the submarine got Klub-S 3M54E1 anti-ship and 3M14E land attack 200-km-range cruise missiles systems retrofitted. It also got another 10-odd Indian and foreign-made systems such as the USHUS hydro-acoustic sonar system and CSS-MK-2 radio communication system newly integrated. The Sindhurakshak upgrade programme cost India $80 million and it will include a complete overhaul of the vessel’s hull structures. The programme also included improved electronic warfare systems, control systems and integrated weapon control system. The vessel’s cooling system too underwent modifications, apart from a ‘Porpoise’ radio-locator fitted and more works carried out to enhance its capabilities, safety and security. The submarine will leave the Russian shipyard and sailed for Mumbai, taking the North Sea route off United Kingdom. A Russian ice-breaker ship will accompany the submarine, which is the first Indian vessel to be handed over after a refit programme in icy winter season. 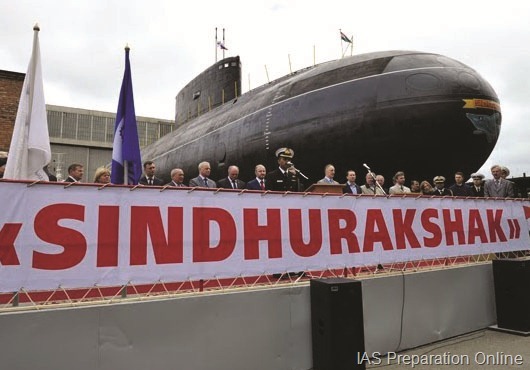 Zvezdochka shipyard specialises in overhaul and dismantling of nuclear-powered submarines and since 1997, it had upgraded four Indian conventional submarines of Russian origin INS Sindhuvir, Sindhuratna, Sindhughosh and Sindhuvijay.